Grab a blanket and a cooler and relax to classic summer band concert at the natural amphitheater in beautiful Heritage Park. Concert site is Sunset Point located at the Western tip of Belle Isle (facing the Renaissance Center). Look for lawn signs directing traffic. Concert attendees are advised to bring lawn chairs and blankets for their comfort. Concert may be cancelled at the last minute due to weather conditions. The button below will show the exact location on Belle Isle. Join the FCB Concert Band for a final “pop up” summer band concert at Riley Park in downtown Farmington. As the FCB wraps up their 53rd season, enjoy a wonderful selection of great music including movies, marches and season highlights. The FCB Concert Band presets an afternoon concert rich in the textures and tones of classic chamber music featuring select ensembles that make up the FCB Concert Band. The full band will then compliment the afternoon with an exciting assortment of compositions including "Incantation and Dance", "Chester", and Sousa's "George Washington Bicentennial March". This will be the last time that the FCB will be performing at Harrison High School because the school is closing at the end of this academic year. Harrison has been “home” for the FCB since it opened in 1970 when Paul Barber became Harrison’s band director. If you enjoy the music of the big band era, then you will love our Valentine Dinner Dance, an evening rich in fine dining and dancing at the elegant Glen Oaks Country Club. Unwind at the cash bar cocktail hour and then enjoy a lavish dinner and music 'til midnight provided by the fabulous FCB Big Band, directed by Mr. Randy Barber. Treat your special valentine to a romantic evening or get a group of friends together for a table of fun. Tickets are available by advance reservation only. Tables of 8 and 10 available. Early Bird discounts for tables are available if you order before January 11, 2019. All seating is reserved. If you are part of a group please let us know. Click on the buttons below for more information or to download a ticket order form, or call 734.261.2202. The FCB presents a holiday classic featuring the 95 piece FCB Concert Band under the direction of Damien Crutcher presenting an entertaining array of concert band classics and holiday favorites. Selections include "Panoramic Fanfare", "Jesu, Joy of Man's Desiring," and "Overture to Candide". We regret to announce that Anjan Shah will not be able to perform at the concert as was publicized due to an unforeseen personal conflict. Saxophonist Andrew Bishop from the University of Michigan Department of Jazz has graciously agreed to appear instead and will Perform Jack Stamp’s “Jig Saw” as planned. More on Andrew Bishop below. Andrew Bishop is a versatile multi-instrumentalist, composer, improviser, educator, and scholar comfortable in many musical idioms. He maintains an international career and serves as an Associate Professor and Chair of Jazz and Contemporary Improvisation at the University of Michigan in Ann Arbor. Bishop’s three recordings as a leader have received widespread acclaim from national and international journals. As a composer and arranger he has received over 30 commissions; numerous residencies and awards and recognition from the American Society of Composers, Authors, and Publishers (ASCAP); the Chicago Symphony Orchestra; the Andrew W. Melon Foundation; the National Endowment for the Arts; and a nomination from the American Academy of Arts and Letters. He earned five degrees in music including a DMA in music composition from the University of Michigan. Bishop is a Conn-Selmer and Vandoren artist. Detroit's premier band festival hosted by the Motor City Brass Band. The FCB goes on the road to support music education in public schools by presenting a combined concert with the Livonia Franklin Symphony Band, under the direction of Kristi Jasin. The FCB Concert Band presents an afternoon fall concert at the MSU Tollgate Eduction Center in Novi - weather permitting. Relax to an evening of great standards, jazz and swing in beautiful Heritage Park. Enjoy an evening of patriotic music and marches at the Amphitheater in Milford's Central Park located at 195 South Main Street at the Huron River. The Red Cedar Festival of Community Bands (RCF), hosted by the Meridian Community Band (MCB), is a one-day event in which each participating band performs a brief, public concert followed by an educational post-concert clinic. The clinics are directed by four university-level conductors who provide insight and techniques for improving musicianship. Visiting artists present instrumental master classes for featured instruments. Audiences enjoy the presentation of a wide variety of traditional and contemporary band literature. The festival combines performance opportunities, learning experiences for musicians, and a forum for networking with other bands from across the state. New this season - the FCB Concert Band will be part of the popular Nardin Park Music Series. A great opportunity to see the band at a special venue. Visit nardinpark.org. 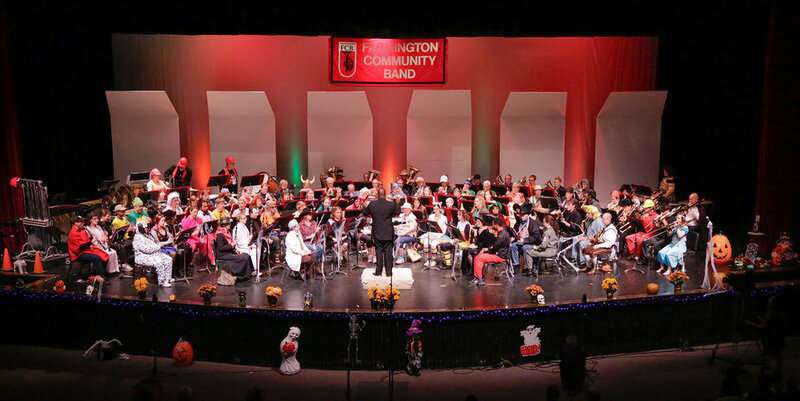 Enjoy an afternoon of great musical variety showcasing the fine instrumental voices that make up the Farmington Community Band music organization including a clarinet choir, flute and brass ensembles, and piano soloist from the Farmington Musicale. But that’s just the beginning - the FCB Concert Band, under the direction of Maestro Damien Crutcher, will entertain you during the second half with an exciting selection of concert band literature. Featured guest conductor, Paul DeRubeis. Guest Conductor, Paul DeRubeis has had a long and fruitful career in music education. He retired from Bloomfield Hills Schools in 2014 after for a total of 38 years, 33 of which were spent at Bloomfield Hills Schools. He was MSBOA District 4 Teacher of the Year in 2003 and 2010 and finalist in 2010. An active clinician and adjudicator for MSBOA, he also serves as committee chair for Michigan Youth Arts Festival for MSBOA activities. Maestro DeRubeis is a graduate of Wayne State University and plays the Euphonium.